All NEMA 5 devices are three-wire grounding devices (hot-neutral-ground) rated for 125 V maximum, with the 5-15, 5-20 and 5-30 being grounded versions of the 1-15, 1-20 and 1-30, respectively. The addition is a 3/16-inch (4.763 mm) diameter round or U-shaped ground pin, 1/8 in (3.175 mm) longer than the power blades (so the device is grounded before the power is connected) and located below them by 1/4 in (6.35 mm) edge-to-edge or 15/32 in (11.91 mm) center-to-center. Compared to the 5-15P plug, the 5-20P plug has the neutral blade rotated 90C and shifted so its inner edge is approximately 1/2 in (12.7 mm) from the hot blade. The 5-20R receptacle may have a T-shaped neutral hole, to accept both 5-15P and 5-20P plugs. The 5-30 and 5-50 are larger, with 1 inch between power pins; 5-30 also has a bent neutral blade.All of these are uncommon, as twist-locking plugs are generally used for high-current applications. Both current blades on 5-15P plugs are nearly always narrow since the ground pin enforces polarity. If the ground pin is removed to make it fit a 1-15R outlet or extension cord, the line/neutral polarity is lost. 1-15P plugs are also compatible with 5-15P sockets. In this case, the socket retains polarity enforcement. Cheater plugs, adapters that make a 5-15P plug fit a 1-15R outlet, are readily available and retain line/neutral polarity, but violate the electrical code in some countries such as Canada. 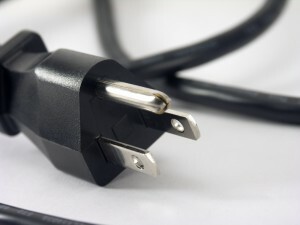 Proper grounding is dependent on the outlet being an ordinary duplex receptacle with a correctly grounded center screw, and the grounding tab of the adapter being connected to that screw. The 5-15R is by far the most common electrical outlet in North America in buildings built since the mid-twentieth century. It is usually installed in a twin duplex configuration (which may be on a common circuit, or alternatively wired with each receptacle on a separate circuit, sometimes switched). The orientation per National Electrical Installation Standards (NECA 130-2010) is with the ground hole on top. Sideways installation is also permitted; in this case, NECA 130-2010 specifies the neutral (long) slot is on top. The idea being that if something conductive was to fall on a partially inserted plug, the risk of a short-circuit would be lower (given that the receptacles are not recessed). In 46 of the 50 United States and all of Canada, tamper-resistant sockets (TRS), also known as tamper-resistant outlets (TRO), are required in new residential construction as of November 2013. These prevent contact by objects like keys or paper clips inserted into the socket. This is accomplished by an interlocking mechanism that needs to have both hot and neutral blades inserted simultaneously to release the small doors blocking the slots. The grounding slot is not blocked by a door. In stage lighting for film and theater, this connector is sometimes known as PBG (Parallel Blade with Ground), U-ground, Edison or Hubbell, the name of a common manufacturer. (The name "Hubbell" can be confusing as several different connectors share this name depending on the company, industry, and use.) In the motion picture and TV production industries, an extension cord that uses this type of connector (usually with 12 AWG or 10 AWG wire) is called a "stinger". Generally, lighting technicians use these extension cords to deliver power to lights rated at 2000 W or less. 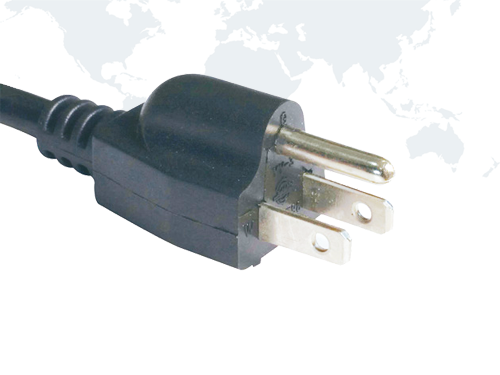 On the international level, the NEMA 5-15P plug and NEMA 5-15R socket are the basis for the International Electrotechnical Commission's IEC-60906-2 standard for 15 amp electrical connectors at 115+/-15 volts.